Posted on September 12, 2012	by Katy K.
I was first introduced to Bechdel by one of the lesbian intern pastors at my church. While I enjoy Dykes to Watch Out For, I recommend Fun Home frequently to people who don’t know where to start with graphic novels. Naturally, then, I had to read her latest book. Fun Home, the book that made Bechdel famous outside of the lesbian and indie comix scene, examined her relationship with her by then deceased father. It was filled with references to the classic English literature that was their closest bond. This book, rather obviously, turns to look at her mother. This is significantly complicated by the fact that her mother is still alive. 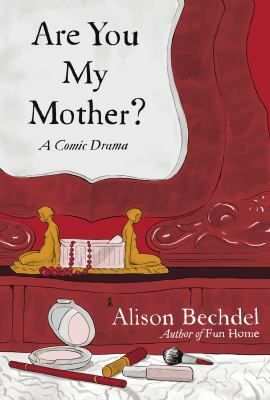 Bechdel’s narrative is frequently punctuated with scenes of Bechdel’s mother discussing her reaction to the current draft of the book. We also meet several of the therapists that Bechdel has worked with over the years, as she examines her relationship to her mother. Throughout, the book is filled with references to classic psychoanalysts as well as female poets. This makes it still fascinating, deep and multifaceted, but also somewhat less accessible than Fun Home. It’s a complex look at the mother-daughter relationship that manages to be deeply universal at the same time as deeply personal. Go for this when you are ready for some deep thinky thoughts. This entry was posted in Books, Uncategorized and tagged graphic novels, memoir, psychology. Bookmark the permalink.